Beyond the metaphors, Trump’s protectionist turn, which is carried out in a threatening manner and not just aimed at China, constitutes another turbulent factor, both from an economic point of view and that of imperialist relations on a world scale. These two aspects reflect two sides of the same coin, as Trump’s economic measures serve an imperialist strategy aimed at both declared rivals and allies who are applying the brakes and who would like the embrace of the stars and stripes, which they have suffered for more than seventy years with varying degrees of enthusiasm, to be less suffocating. In fact, it is very doubtful that the custom duties will really be able to protect the entire US economy from foreign competition. Perhaps they will give a bit of respite to certain sectors of US manufacturing, like steel or aluminium, but many more will be hit and the retaliation will fall upon the workforce (but not just on them), who will probably be the victims of redundancies and worsening working conditions. As is well-known, after decades of “globalisation”, it is difficult to disentangle the chain of value, since the productive process, involves so many states: you just have to look at the “made in” label stuck on goods to see to what extent their constituent parts are “international”. Moreover, it is no mystery that, for example, the large distribution chain Wal-Mart has many articles on its shelves which are entirely made in China. Therefore, “America First” served up in a protectionist sauce threatens to seriously reduce the enormous advantages that the tax reform launched a few months ago is generating for American firms. In this regard the mountain of money given by Trump to his capitalist accomplices is yielding the expected fruit — far from stimulating investment and therefore jobs in the so-called real economy, this mountain of money is mostly employed for speculative purposes, to strengthen financial activities aimed at realising extra value, at collecting surplus value extorted from the productive process, without taking part in that process. But, to return to protectionism, perhaps the duties, like those threatened on 11 May for cars produced abroad, are intended, in the creative mind of the New York property speculator, to compel the car manufacturers of Europe and Asia to increase their production in the US, but this would require large investment, more publicly-funded incentives at the expense of the taxpayers (as always) and, not last, conditions of work that approach those imposed on the working class in “offshore” destinations, like, for example, those in Mexico. Which, moreover, has already happened; however, “approaching” does not mean equal to. So as to not pose as prophets, we say that it is very probable that so-called reshoring, the repatriation of productive activity located abroad, will not go that far. But the thinking heads of the US bourgeoisie, and perhaps even those that think like Trump (who a few years ago was considered a buffoon of popular entertainment, good only for rubbish TV, but, who has been propelled to the top of the leading world power by the difficulties in political management generated by the crisis), know this. It is this, the story of the “populists”, who have won power or made gains everywhere, that has made (political) life more complicated for the traditional bourgeois political class. The history of the bourgeoisie is not lacking in figures like Trump (remember Italy’s national glory, the ex-cavalier Berlusconi? ), starting with that Emperor of the spectacle, Louis Bonaparte, to whom Marx dedicated some of his most brilliant and magisterial works. But, beyond the “unpredictability” of his course, the US President, even if in the badly joined-up and partly disconcerting terms which are characteristic of him, expresses a need, as was said at the beginning, to combat the economic and political growth of the US’ competitors (to not say adversaries) on the world imperialist chessboard, or at least to put the brakes on their unhealthy idea (for the US) of, if not striking out on their own, at least carving out more room for autonomy vis-à-vis their burdensome ally. In short, the USA must continue to set the good and the bad tempo over the centuries and the rest should adapt themselves to it. This, however, is more and more complicated, because of the crisis that began 40 years ago, whose development has put China closer and closer to the heels of the USA and pushed the quarrelsome European bourgeoisie to undertake the difficult, and not to be taken for granted, road to a unitary pole of imperialism. If China has become what it is, this is due in significant part to “Western” capital, including US capital, but now Chinese “market socialism” (that’s not a bad joke…) is menacing the first place held by the USA in many economic sectors, starting with hi-tech manufacturing. Behind the duties on steel and aluminium, there is the real objective of harming the “Made in China 2025”1 project, which aims at developing or accelerating the development of high technology, to make the leap from the “factory of the world” based on products with a medium or low added value (to use bourgeois terminology: in reality, value extorted from the working class) , to one that uses the most advanced technologies. Although, according to certain bourgeois observers, the distance between China and the US is still large, and in certain sectors, very large, the gap is being made up very rapidly, even, it seems, more rapidly than forecast, which cannot fail to make the Yankee bourgeoisie think, no matter who their supreme representative is. 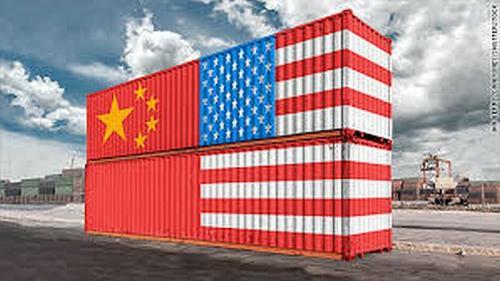 Washington justifies the duties and the blocking of the acquisition of certain companies by Chinese capital as retaliation against China’s supposed addiction to the theft of intellectual property. True or not — something which is anyway judged by the norms of the bourgeois world — it remains a fact that the USA cannot simply dominate the world through its brutal military superiority, which, furthermore, presupposes a military-industrial apparatus second to none, especially in the hi-tech sectors. In some ways the same considerations can be made with respect to the protectionist “insults” announced against Europe, which, in passing, are supposed to release more money for the maintenance of NATO. Trump, obviously, didn’t like Merkel’s musing about the fact that Europe (guided by Germany) is starting to walk by itself, without always having to have Uncle Sam holding its hand. Clearly, in the present state of affairs, such a hypothesis is just a hypothesis, and isn’t even close, but, if the US trade deficit with the EU, and, in particular, Germany, is added in, then there starts to be more than just something unpleasant. It is not possible to yet know if, how and how far this protectionist battle will go forward, but it is a type of battle that has historically laid down the preconditions for the birth of acute tensions between states or for the accelerated worsening of these, to the point where they vent themselves in open conflict, no longer on the economic terrain, but on the military one. Already proxy wars have flared up in various parts of the planet and there is no guarantee that sooner or later these will not be fought in more direct fashion. The horizon is heavy with storms and it will be the course of a crisis which isn’t going away to write the screenplay for the near future.